Cannonball Restaurant & Bar are delighted to introduce Nyetimber, England’s leading producer of world class sparkling wines to our new wine list. Restaurants are as individual as we are. They grow and mature. They have an odd off day but they are full of life and love living it to the full. Cannonball Restaurant & Bar is loving living its life. The restaurant has shaped the whole identity of Cannonball House with its commitment to local suppliers, fresh contemporary Scottish cooking that’s welcoming grown up when it needs to be be but still relaxed enough that it feels fun at its heart. We change our full wine list once per year. It really is a massive job. The tasting alone is a challenge. A good one but a challenge as there are always so many delicious wines it’s almost impossible to choose. One wine which has been on our Cannonball wine list from day one is one you may not have had the pleasure of tasting yet. Nyetimber is now regarded as one of the best sparkling wine producers in the world. Now, you know we can’t call it champagne but it is made to all the same criteria from the soil to the vines to the fermentation to the bottling – and the air miles are far less than its counterparts over the channel – but most significantly their wines really taste divine. We are now listing Nyetimber’s core range of 4 award winning sparkling wines and everything they do at Nyetimber is done in the passionate pursuit of the very best quality possible. Which makes a perfect fit for us here at Contini Cannonball! We’re offering a glass with a little canape as an aperitif in the restaurant for £12. A good excuse to have a try on your next visit. The Nyetimber estate has a long and rich history with its earliest beginnings first recorded in the Domesday Book in 1086. There it is named as a small-holding called ‘Nitimbreha’ which likely referred to a small timber plantation or “New Wood” in Old English. Then in 1139 a Benedictine Monastery was established which, under the dissolution of monasteries in 1536, came into the possession of King Henry VIII. Thomas Cromwell lived here followed by Anne of Cleves who was given the estate in 1540 after her marriage to King Henry was annulled after 6 months. The planting of the first vines 448 years later in 1988 at Nyetimber produced their first vintage, a 1992 Blanc de Blancs which was released in 1996. These vines make up the holy trinity of Champagne grapes namely, Chardonnay, Pinot Noir and Pinot Meunier and Nyetimber’s vineyards were the first in the UK to be devoted exclusively to these varieties. More recently, there was the decision in 2006 that Nyetimber wines deserved an audience on the world stage with the single aim to make the finest English sparkling wine there is. With geography, climate, passion and determination on their side, they knew they could rival the very best in the world, including the wines of Champagne. Nyetimber’s wines are produced from 177 hectares of vines planted across 8 vineyards in West Sussex and Hampshire. Southern England is perfect for the production of quality sparkling wine. The chalk seam that allows Champagne grapes to flourish is the very same seam that runs under the lee of the South Downs. This is where, sheltered from coastal winds, Nyetimber’s vines are all planted. The climate here also allows for the slow ripening of the grapes, letting them achieve the optimum level of development for their wines, as well as the complexity and finesse that Nyetimber always strive for. 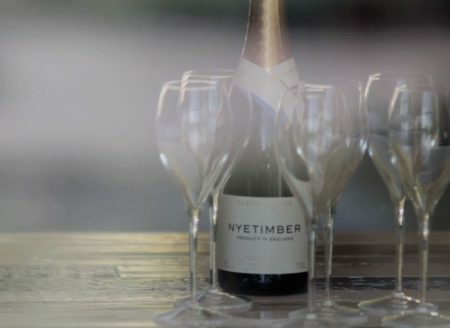 All Nyetimber’s wines are crafted according to the traditional method of Champagne, aging them for extended periods of time and giving the bottles sufficient post-disgorgement time before release.